Johanna Konta fought back from a set down to clinch a spirited victory over Greece for Great Britain in their Fed Cup round-robin tie. The British number one gave the hosts an unassailable lead by beating Maria Sakkari 4-6 6-2 6-3, while victory in the doubles later sealed a 3-0 win. Earlier, Britain’s Katie Boulter survived a scare to beat Greece’s Valentini Grammatikopoulou 6-3 4-6 6-3. The result means GB will top Group A if they beat Hungary on Friday. Thursday’s victory follows Wednesday’s 3-0 rout of Slovenia and keeps GB’s bid to reach a third consecutive World Group II play-off on course. “I had to work very hard to bring my level up because she raised her level and was playing far better than me. I had to really dig deep and make it a battle,” Konta said. World number 39 Konta sealed her second singles win in as many days after an exhausting two hours and 42 minutes, as Sakkari – ranked just one place above her – netted with a backhand on Konta’s second match point. The rubber’s key break of serve came with Konta 4-3 up in the third set, as she broke to love after a double fault from the Greek. Both players were visibly frustrated at times during the match at what they saw as questionable line calls – including one on match point for Konta – with Sakkari later describing the line judges as “the worst I have ever seen in my life”. 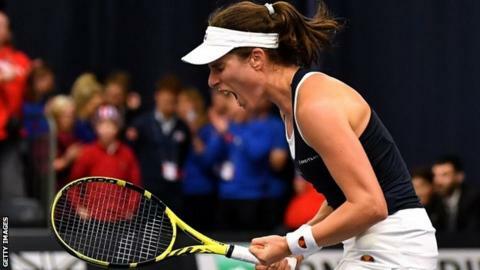 Konta was backed by a passionate, sold-out crowd of 1,800 at the University of Bath, with GB playing on home soil this week or the first time in 26 years. 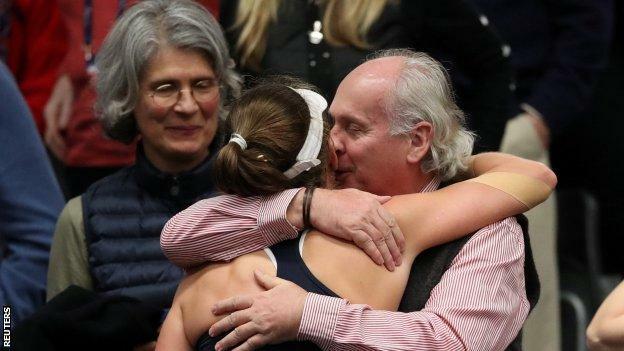 And she was also watched by her parents, Gabor and Gabriella, and shared a “big sweaty hug” with them afterwards. Harriet Dart and Katie Swan later beat Anna Arkadianou and Despina Papamichail 6-1 6-4 in the doubles to secure a second 3-0 success. Boulter, 22, dropped the second set against the world number 171 Grammatikopoulou before recovering her composure to best the 21-year-old. 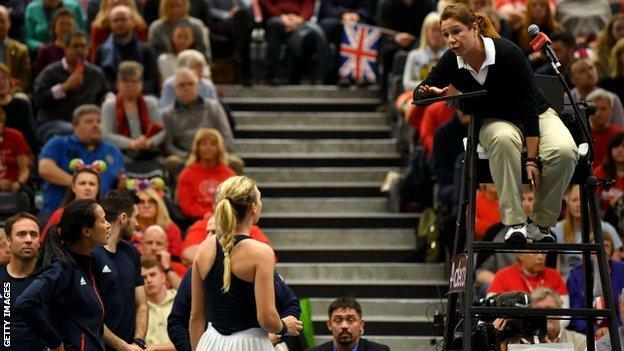 GB’s number two temporarily appeared unsettled after the umpire controversially overruled a line judge’s call when the Greek player was serving for the second set. The home fans thought the ball had landed out, which would have handed Boulter two break-back points. However, she recovered her form as the match entered a third hour and, ultimately, a gutsy victory continued her 100% record in Fed Cup tennis and kept Anne Keothavong’s side on course to top Group A. Asked what the captain had said to her during the match’s key moments, Boulter replied: “The only thing that I’m going to say is that she said ‘heart and legs’. That is what we’re made of. I think I showed it out there. “My mentality is to go out and fight, no matter what happens. It was a really tough match and I’m just happy to get through it. Having been outside the top two tiers since 1993, GB are bidding to reach the World Group II play-offs for a third consecutive campaign, and they will need to win three more consecutive ties to be promoted. In Group A, Hungary have joined GB with two wins so far before they meet on Friday with a place in Saturday’s play-off at stake.